"For Handcream-I use the Aesop Resurrection Hand Balm which I get a ton of questions about when I put it on because it smells amazing! Sunglasses-I don't leave the house without my Ray Ban aviators. iPhone 5S-Does that even count? I can't be anywhere without my phone. Perfume-I have a Travalo filled with Zara White and I recently got the Nirvana White for the Summer months. Lip Product-As you can see I have a ton but I am a certified lip hoarder-no shame here! I always have my Jo Malone Vitamin E Lip Balm just to keep my lips hydrated at all times. Notebook-Now I wouldn't be a blogger if I didn't have a notebook at all times to jot my ideas down!" 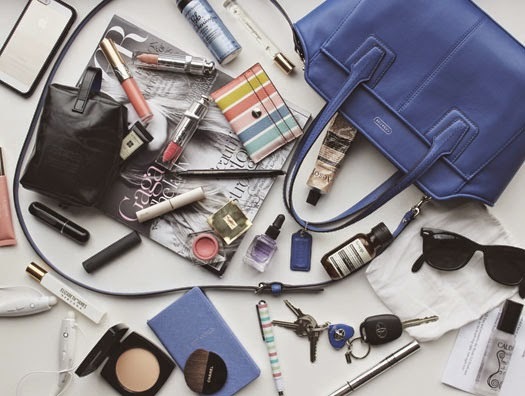 -What are your handbag staples? Ooooh that's some in-bag goodness! She can fit so many good things into her bag - love it! OMG COACH LOVE! Love the mini tanner in the second pic! A bright blue bag is on my shopping list. Right now, I have my Marc by Marc Jacobs Pretty Hobo with me. It has my Coach purse, a Marc Jacobs cosmetics purse which has about half of my lipsticks in it and some real techniques brushes, pressed powder! There is my iPhone 5 in a Coach case, my Gucci Sunglasses, my iPad mini, a Logitech laser pointer, my car keys and a box of panadol. It's gorgeous right!? I've seen some Zara City Bags in similar hues that are also stunning. 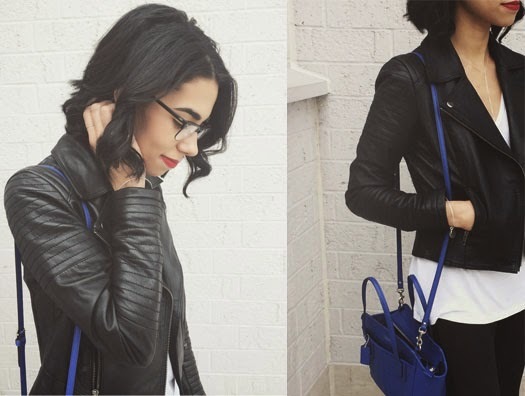 Your bag sounds great-all the lip products <3.